Last week I went to a packed out retirement function for UNISON Regional Secretary, Linda Perks. This is her leaving message to staff and members. 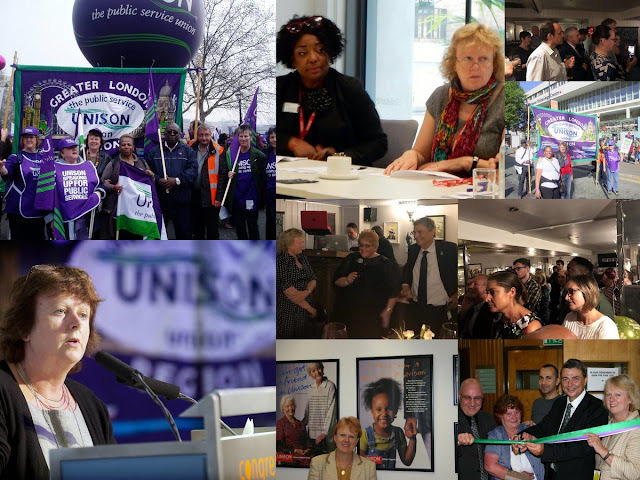 “I write to advise that I will be retiring from UNISON on 30 September after working for the union for over 34 years and being a member since 1979. As many of you know, I came to the Greater London as a Regional Organiser in 1990 and, following working in the South East, Head Office and East Midlands, returned as Regional Secretary in 2004. I have very much enjoyed my time in the region, and greatly appreciate the support given to me by so many of our activists, branch officers, senior lay members and staff. Together we have worked hard to build and sustain strong trade union organisation in London’s public services, and I believe we have been successful in building a union to be proud of. I will remain a retired member and intend to continue being active in the Labour Party, so hopefully our paths may cross in the future. Steps are being taken to fill my post, in the meantime Stephanie Thomas will continue in the role of Acting Regional Secretary. Any queries should be sent via Nick Turnbull. I read out a message of thanks from Yvonne Green, the UNISON London Regional convenor (who was aboard on holiday), to Linda and I also told a little known tale of her cleansing the route of trade union marches in London from unnecessary litter. We will miss Linda but wish her well in her retirement and having been recently selected as a Labour Councillor candidate in Greenwich, wish her well in the 2018 elections and we will watch this space. Tony, get you stop trolling and take your libelling elsewhere please?